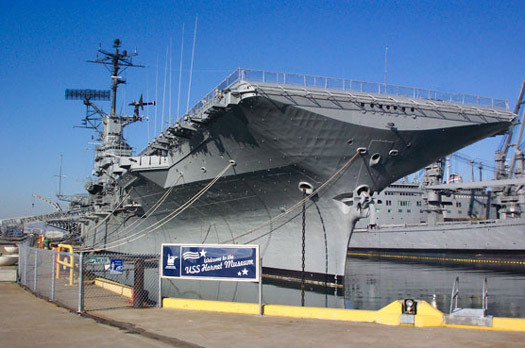 Commissioned in 1943, survivor of World War II, Korea and Vietnam, and recovery ship for the Apollo 11 and Apollo 12 lunar missions before her decommissioning in 1970, the aircraft carrier USS Hornet is now a national and state historic landmark and museum floating in the waters of San Francisco Bay. My daughter Laura is a volunteer docent-in-training on the Hornet and really wanted to show us where she works, which is how Karen, I, and our other daughter Robin got ourselves a private tour today. It was, to understate enormously, terrific. Between its decommissioning in 1970 and its debut as a museum in 1998, the Hornet was mothballed, neglected and abused (a recurring theme from my previous post). I'm sure hundreds of volunteers put in zillions of man-hours making the ship presentable, but what most impressed me was how much it looked like the crew had only just left. Visitors can wander much of the Hornet by themselves (or see more of the ship if led by guides like Laura), and it's remarkable how many areas and artifacts are accessible and unguarded. You really do have the run of the place. 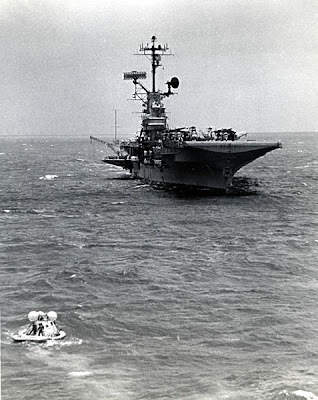 Today the Hornet was crawling with several troops of Boy Scouts who'll spend tonight bunking three-high in the crew's quarters. I was both touched by the museum staff's apparent faith in humanity and fearful that someday someone will vandalize something or walk off with a neat souvenir and ruin it for everyone. It's authentic and casual and almost too cool to last. As much as I appreciate the Hornet's history as a warship, particularly its heroic service during World War II, it's the vessel's special place in space history that resonates with me. Following their forays to the Moon, the astronauts of Apollos 11 and 12 took their first steps back on Earth on her deck (in fact, today there are footsteps painted on the deck showing Neil Armstrong's path from the helicopter that plucked him, Aldrin and Collins from the Pacific). The Hornet at work in July 1969, giving Apollo 11 (lower left) a lift the rest of the way home. I found this sticker on the door of the Hornet's print shop, curiously located right next to the brig (just in case those writers got out of line, I guess). I imagine a contemporary cartoonist on board added Snoopy's fangs. 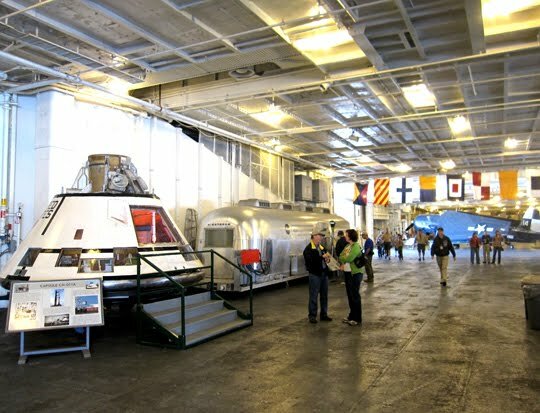 The ship's cavernous hangar deck has many aircraft from different eras on display, all interesting in their way, but nothing draws a man's gaze like his first love--in my case, a space capsule and an Airstream trailer. The capsule is CM-011, an unmanned prototype Apollo-style command module shot into space in 1966 in preparation for the manned lunar missions to follow. The Hornet recovered this spacecraft as well. 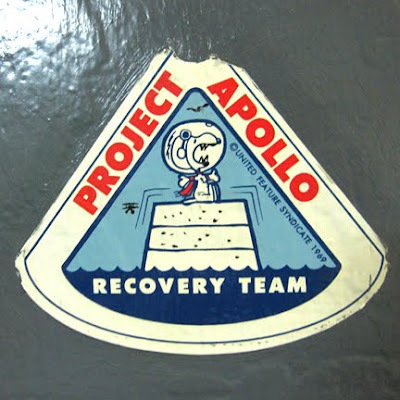 Friend-of-the-blog and newly minted rocket scientist Jim O'Kane informs me that "there aren't many Block I Apollo spacecraft in the world, and it's neat to have one of them so nearby." I can't argue with science. The silver Airstream trailer behind it was used to quarantine the astronauts of Apollo 14 after their return from the Moon (the Hornet did not recover Apollo 14, but this "mobile quarantine facility" is very similar (identical?) to the one used for Apollos 11 and 12, which currently resides in the Smithsonian). When I mentioned on Facebook that my daughter volunteers on the Hornet, Mr. O'Kane asked if I'd seen the CM-011 command module and how close one could get to it. At the time I hadn't yet visited the ship, but today I took this photo to answer him: close enough to give it a big smooch, Jim. Also, the hatch was open, with no barriers blocking the way; if I'd wanted to, I could've climbed in (might've gotten arrested for it, but . . . ). Oh, and Jim--we got to step inside the Airstream, too. I savor your envy. 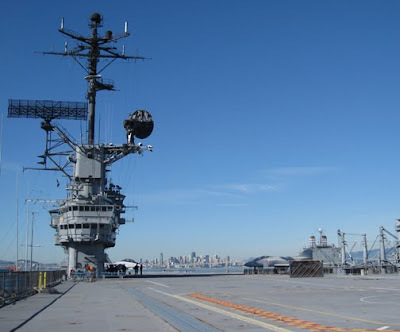 A perfect Bay Area day on the flight deck of the Hornet, with the towers of San Francisco across the water in the distance. Today was "Living Ship Day," a monthly event for which the Hornet staff puts on full ruffles and flourishes. Best of all, they run the elevator that was built to lift aircraft from the hangar deck up to the flight deck. I shot two videos. The first (which I shot from the bridge) shows a group of visitors being lifted up to the flight deck. The second I shot as we took the same elevator down. 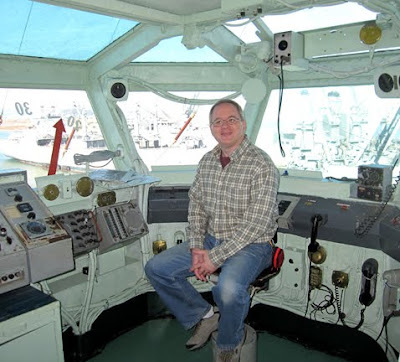 More than once, it occurred to me that if nine-year-old me had had any idea that one day he'd be standing on the very ship he was watching rescue his heroes from the ocean (standing in the exact same spot they stood! ), well . . . I never would have believed it. And if you ever find yourself near the city of Alameda, you could hardly spend a better couple hours than touring the Hornet. Thanks, Laura, and thanks to all the people who keep her afloat! EDITED TO ADD: I've posted a bunch more photos from the Hornet in my Facebook album, for anyone who's interested. wow. now that was cool. This is really, really cool! Must share it with Husband, who will be three shades of green with envy. Okay, you've just bumped this up to the tip-top of the list of things to do with (or without) Adam and/or Grace the next time I'm in Oakland. Wonderful. Nat, thanks! Took me a minute to figure out what was going on, but it's neat. Sherwood, the advantage of visiting the Hornet on a "Living Ship Day" is that they run the elevators and offer a few other extras. However, I understand that most of the time the ship gets much fewer visitors, so on an "off" day you'll likely get a docent all to yourself. Which has its advantages ;-). Passed on to my Navy vet son, who was delighted. Yes, Brian - as predicted, I am totally envious of your make-out session with CM-011. Great Holy Hannah -- that's the most "accessible" CM I've ever seen! Apollo 6 in Atlanta is unsealed, but there's a plexiglas window over the hatch. CM-011 looks like it's had the whole crew access hatch frame removed. Amazing! The center console looks like it's printed cardstock, though - - which would make sense, since it was just a test module. I definitely will be out for the Hornet tour so that your daughter will have the opportunity to yell at me to stop climbing all over the exhibits. Also thinking about the cultural vertigo of seeing CM-011 in person: this was an Apollo that flew before Gemini XI AND Gemini XII. The launch was also before the USAF's MOL test flight of November 3, 1966. CM-011 is, of course, the sister ship of CM-012, or Apollo 1 as we call it now. Just about everything wrong with the design of CM-012 was also wrong with CM-011 - - except 011 didn't kill anybody. 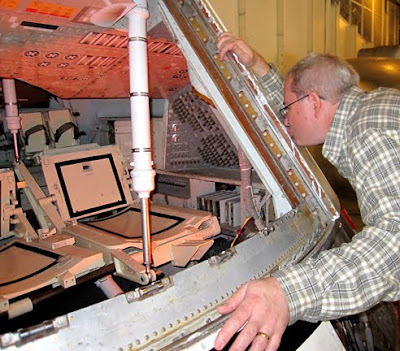 The reason that there aren't more Block I spacecraft around is because CM-012 and CM-014 were taken apart -- CM-014 acted as a guide for dismantling the Apollo 1 spacecraft (CM-012). Apollo 7 would fly with a Block II spacecraft, a unified hatch in place of the double hatch from the Block I spacecraft. So now I'm really wondering about the disposition of that Block I hatch from CM-011. And yes, it's really neat to have this stuff within driving distance of your home, Brian.